Total Immune & Energy Support! Proven Probiotics Total Immune & Energy - 14 Sachets with Vitamins B, C and D. A delicious effervescent drink containing real orange. May help support immune system and energy status. Contains the unique Lab4 group of probiotic organisms. These four friendly and beneficial species of bacteria are naturally present in our intestines, but their numbers can be reduced due to the stresses of our modern lifestyle. This resultant imbalance in flora may produce feelings of bloating and intestinal discomfort. Lactobacillus acidophilus (CUL60), Lactobacillus acidophilus (CUL21), Bifidobacterium animalis subs p.lactis (CUL34), Bifidobacterium bifidum (CUL20) - 5 billion viable cells. Fructose, Vitamin C (Ascorbic Acid), Acid (Citric Acid, Malic Acid, L-Tartaric Acid), Potato Maltodextrin, Potassium Bicarbonate, Corn Maltodextrin, Sodium Bicarbonate, Yeast Cell Wall Extract (Beta Glucans), Orange Puree Powder, Microorganisms (Lactobacillus acidophilus CUL-60 & CUL-21, Bifidobacterium animalis subsp. lactis CUL 34, Bifidobacterium bifidum CUL 20), Elderberry Extract, Acacia Gum, Caffeine, Anti-caking Agent (Silicon Dioxide), Nicotinamide, Natural Flavouring (Orange), Colour (Caramel, Beta Carotene), Zinc Citrate, Calcium Pantothenate, Guarana Seed Extract (Paullinia cupana), L-Glycine, Dicalcium Phosphate, Coenzyme Q10, Sweetener (Steviol Glycosides), Vitamin B6 (Pyridoxine Hydrochloride), Riboflavin, Modified Corn Starch, Microcrystalline Cellulose, Thiamine Mononitrate, Vegetable Oil, Antioxidants (Sodium Ascorbate, DL-Alpha Tocopherol, Ascorbyl Palmitate, BHA), Sunflower Oil, Folic Acid, Sucrose, Biotin, Sodium Selenite, Vitamin B12 (Cyanocobalamin). As a food supplement dissolve 1 sachet into a small glass of cold water or juice and enjoy. Alternatively just take directly into the mouth for that tingly orange burst sensation. If required, two sachets can be taken per day. This will provide the same level of Lab4 friendly bacteria used by participants in the Cambridge and Sheffield studies. If two sachets per day then the caffeine level will be 200mg. Women who are pregnant or planning a pregnancy should consult their doctor before taking supplements. Excessive consumption may produce laxitive effects. 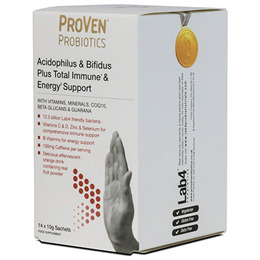 Below are reviews of Proven Probiotics Total Immune & Energy - 14 Sachets by bodykind customers. If you have tried this product we'd love to hear what you think so please leave a review. Great product! Works and tastes great!